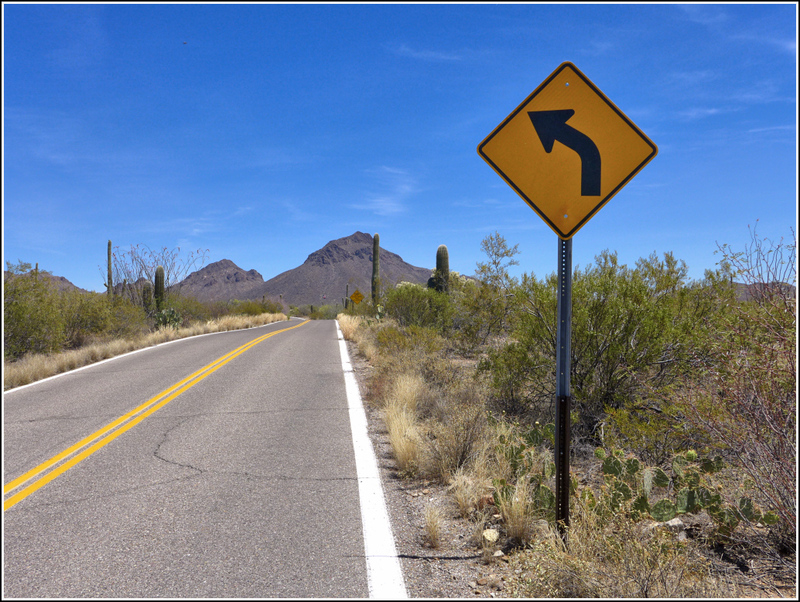 MARK IS 0.65 MI SW THEN WEST ALONG MCCAIN LOOP ROAD FROM ITS SE JUNCTION WITH KINNEY ROAD, IN TUCSON MOUNTAIN PARK, WEST OF TUCSON, AZ. IT IS ABOUT MIDWAY BETWEEN GATED, DIRT ROAD TO SOUTH AND SECOND DEEP ARROYO (DIP IN ROAD) WEST OF BEND IN MCCAIN LOOP ROAD AND ABOUT 20 PACES SOUTH OF ROAD. NO TAPE MEASUREMENTS WERE DONE. ON CONCRETE POST PROJECTING ABOUT 15 CM. NO WITNESS POST PRESENT. 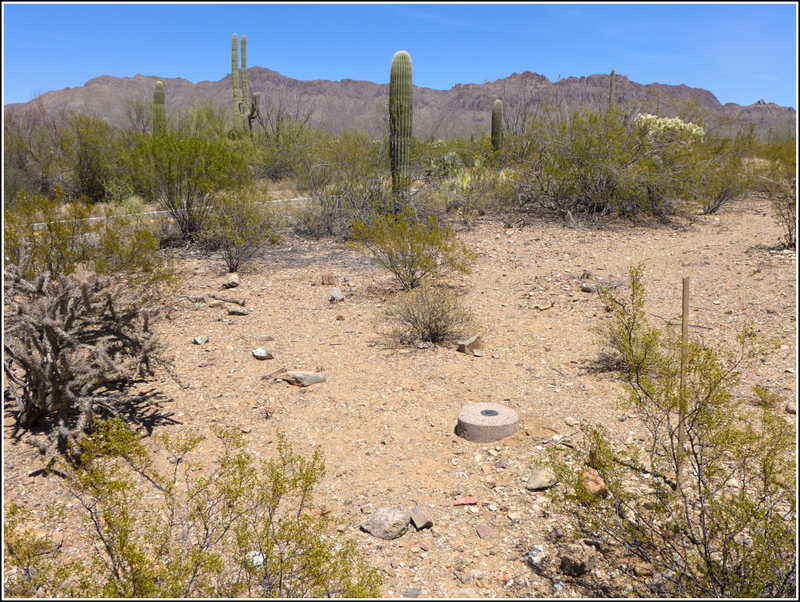 It's fitting that our first benchmark find on this trip to Arizona would be one that was a bit of a mystery to us. 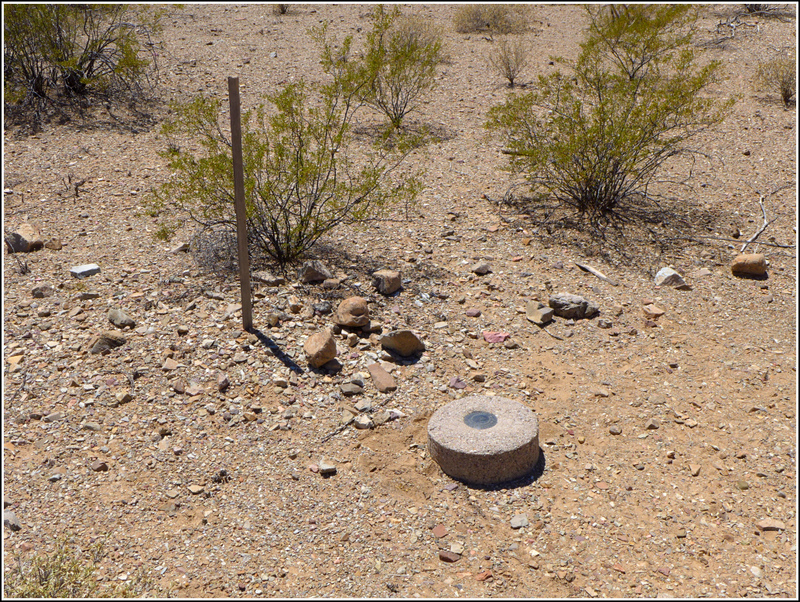 This mark was supposedly "presumed destroyed," but when researching beforehand I could see no reason why it should be, since the area is still undeveloped desert. We couldn't see the mark on Google Street View, but it was clear that nothing in the area had been disturbed. Once we reached the area, after this morning's hike on nearby Brown Mountain, we found the mark exactly as described and in good condition. Also, the date of monumentation is wrong. According to the stamping on the disk it was set in 1951, not 2006 as stated on datasheet. Because the mark is still officially destroyed, there is no way to link directly to the datasheet in the NGS database. For now, I'll copy the description here for reference. If we're successful in getting the mark "un-destroyed" the datasheet will become available again, and I'll be able to link to it. Recovered in good condition. 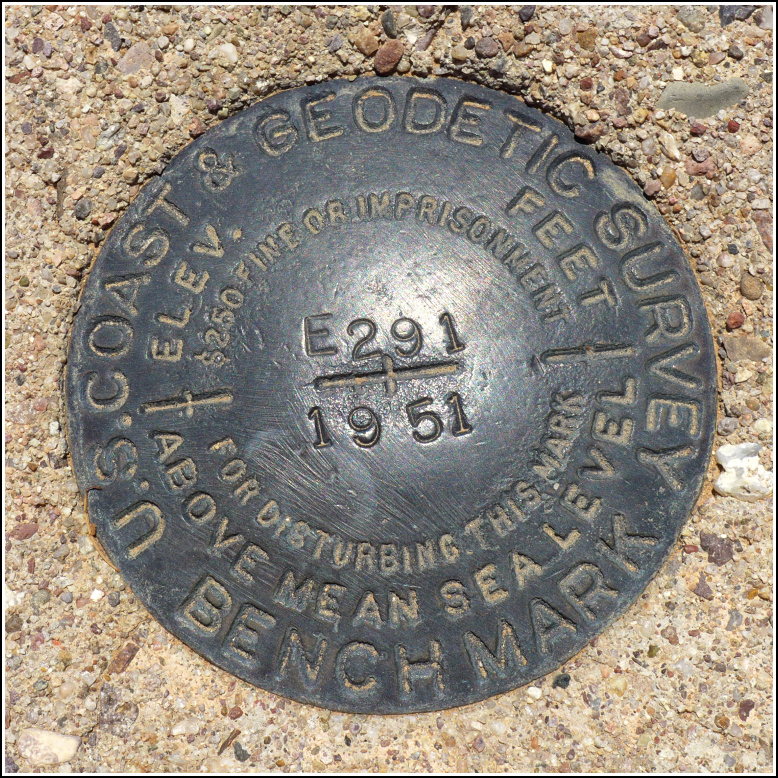 The disk is stamped with a monumentation date of 1951. A wooden stake about 4 ft (1.2 m) south of the marker serves as a witness post. Looking E along McCain Loop Rd. toward Gates Pass. Mark is to the right.